John Dizikes, professor of emeritus of American studies at UC Santa Cruz, addressed the crowd. 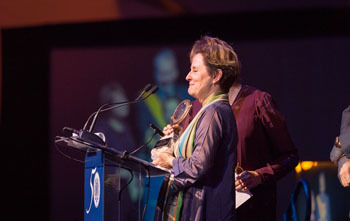 Alice Waters beamed as she accepted the Foundation Medal. She also designed the menu for the evening. Tandy Beal & Company's dancers added a splash of vibrancy and color to the evening. 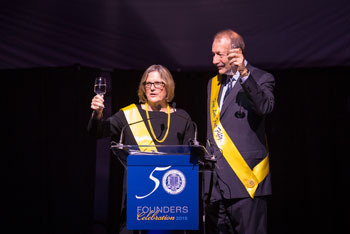 Master of ceremonies Kathryn Sullivan (Stevenson '73, Earth sciences), the first American woman to walk in space, toasts the crowd with UC Santa Cruz chancellor George Blumenthal. 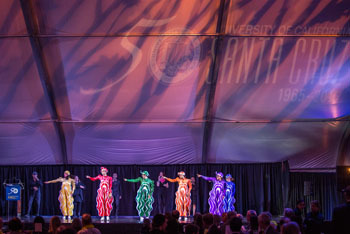 The first UC Santa Cruz students couldn't have imagined the scene at Saturday night's spectacular Fiat Fifty celebration on campus. "They ate dinner right over there," said Chancellor George Blumenthal, addressing a capacity crowd of 750 revelers, and pointing in the direction of the nearby East Field House. "And here we are, eating in a tent! But I'm sure they didn't eat as well as we're eating tonight." Blumenthal was right about that. 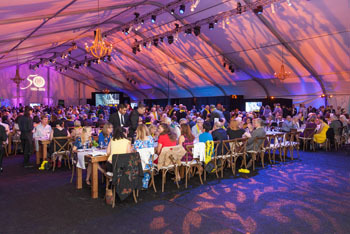 The 21,600-square-foot tent in question stood in floodlights on the East Field overlooking Monterey Bay, and the food in question was fresh and organic haute cuisine in a menu designed by legendary chef Alice Waters, with 120 cooks and waitstaff preparing and delivering it to the tables. Dinner entertainment by local arts organization Tandy Beal & Co. had diners cheering and gasping at the sight of artists leaping through balanced hoops and performing other feats of agility and strength. They also watched a film presentation that took them right back to the possibility and excitement of 1965. The speakers kept a strong focus on how much ground the students and professors have covered over the years, and the achieving of seemingly impossible goals. Chancellor Blumenthal spoke of the people who rose to meet the challenge of the organically grown strawberry and the quest to map the human genome. But it was also an evening with light touches and surreal and sublime moments: diners mingling with performers dressed whimsically as peacocks, bears, and giant birds, a juggler beckoning people toward their seats. The grand celebration was meant to be a big and bold but quirky statement: UC Santa Cruz has come a long way from its humble roots but it has not abandoned its creativity and iconoclastic spirit. The evening's entertainment—Tandy Beal & Co.'s gravity-defying, pole-climbing, limb-contorting dance troupe, performing alongside a capella group SoVoSó—illustrated that spirit. 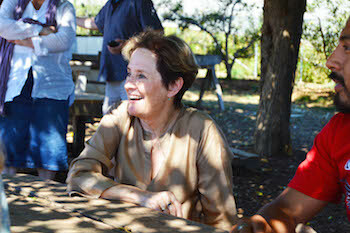 So did the evening's keynote speaker and Foundation Medal honoree Alice Waters, the celebrated chef and food activist who spoke of her kindred spirit with UC Santa Cruz, and in particular its pioneering Center for Agroecology and Sustainable Food Systems. Someone yelled "Go Alice!" as the food impresario took to the podium. Waters drew loud cheers after she made a sly joke about the Fiat Fifty logistics early on in her presentation, noting that she "never liked eating in a tent, but you've put on the greatest show on Earth." She continued by saying she resonates with the work being done at UC Santa Cruz, "an institution that has nurtured me and is really close to my heart, an institution that still expresses so many of the values I cherish and I fight for every day." She noted that Chez Panisse opened its doors in 1971, the same year the farming program started at UC Santa Cruz. She had special praise for alumni who have been "on the forefront of the (food) movement, who paved the way" for farmers, teachers, cooks, community activists, and policymakers who learned the power of connecting with the land from this campus. Among them, she singled out Drew Goodman of Earthbound Farm, professor and researcher V. Ernesto Mendez, Greens Restaurant founding chef Deborah Madison, and Nikki Silva and Davia Nelson, otherwise known as The Kitchen Sisters. Earlier in the day, Waters toured the 33-acre UC Santa Cruz farm and visted with apprentices in the CASFS Ecological Horticulture program before having lunch at the Alan Chadwick Garden where an organic agriculture project first began on campus in 1967. Waters, who had a candid conversation about life and food with UC Santa Cruz's Review magazine this summer, also praised the dedicated UC Santa Cruz students who work at the Homeless Garden Project in town. "I don't think it can be overemphasized that UC Santa Cruz and Chez Panisse were born in the free speech movement," she said. Those currents fed both the intellectual community on campus as well as the menu at her groundbreaking restaurant. The evening was also a time to celebrate the original students, staff, and faculty members who took such bold risks and helped establish UC Santa Cruz as an intellectual powerhouse at a time of cultural and political foment. 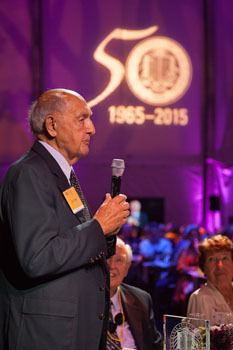 A special Fiat Lux Award was accepted by Hal Hyde, founding vice chancellor of business and finance, and emeriti faculty members John Dizikes and Jean Langenheim. Langenheim drew whoops from the crowd when she mentioned spending "45 of my now 90 years" teaching at UC Santa Cruz. She spoke of all the devoted faculty who could just not pull themselves away from the campus and kept giving it their intellectual and creative energy long after they retired. Master of ceremonies was Kathryn Sullivan (Stevenson '73, Earth sciences), the first American woman to walk in space. She told the crowd about the various ways UC Santa Cruz changed her life. "When I arrived on campus in 1969, I was horrified and annoyed at the requirement to take three science courses," she admitted. "I did everything I could to get out of taking them." But two of the professors who taught those dreaded classes—Biology Professor Todd Newberry and Earth Sciences Professor Gary Griggs—changed her life and kindled her first serious interest in science. Said Sullivan, "They saw the world expand before the eyes of a young student."